ARC volleyball head coach Ashlie Hain, center, watches her team during a 2013 game. She has accepted a position to become head coach at UC Irvine. 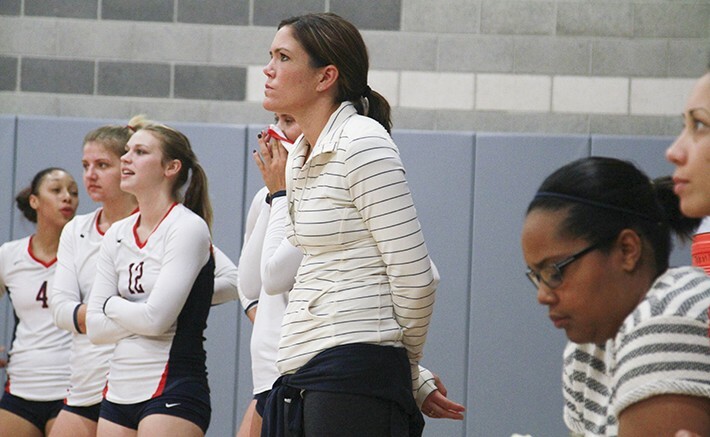 American River College’s volleyball program has seen arguably its highest peak under head coach Ashlie Hain, but will transition now that Hain has taken the head coaching position at the University of California, Irvine, her alma mater. Hain, who could not be contacted prior to deadline, began as head coach in 2009, and transformed a struggling program into one that finished every season but her first with a winning record. The team finished 4th in the state in 2013, an all-time best for ARC, and also won an undefeated conference championship, another first. Hain competed for UC Irvine in 2003 and 2004 in the NCAA tournament, and returns to the college after a professional career in Europe as well as her time as a college and club coach. According to Warzecka, ARC did not receive permission from the Los Rios district to hire a full-time, tenure track professor as a replacement for Hain, who also taught Kinesiology courses. But they have found a new head coach in Gabe Gardner, a gold-medal Olympic volleyball player for the United States and volleyball club coach with “deep local ties with volleyball clubs in this region,” said Warzecka.